The problem faced by the effort to address climate change is similar to that faced by those who seek to teach the theory of evolution to the general public. The general theory of evolution can be quite effectively explained in fifteen minutes, so anyone who has no strong motive to deny the theory can come to understand it. Unfortunately, it’s similarly possible to propose a variety of objections to the theory that take about fifteen minutes to explain, that sound quite persuasive if you don’t further investigate the question yourself. As an example, it’s true that there are hardly any vestigial organs known that have no function whatsoever. It’s similarly true that the vast majority of mutations observed are harmful. It’s also true that the theory of evolution can be used to back up ideas that are taboo in our modern society (eugenics). It’s also true that we generally can’t directly observe vast changes in organisms, as those tend to occur over vast periods of time. Finally, it’s also true that there have been forgeries that were used as evidence for the theory (Piltdown man). Thus, someone who has a motive not to believe in evolution will find sufficient evidence to reject the theory should he wish to do so. This is even true for some theories that the vast majority of the public chooses not to question, simply because they have no motive to question them. A fifteen minute presentation on the mysteries surrounding the moon landing would be sufficient to leave you wondering if we ever really did land on the moon. Of course, someone who observes the evidence proposed for and against climate change can conclude that the vast majority of experts consider this a big threat and that the risk of being wrong and assuming the risk to be exaggerated is not worth the benefit. This is a rather unsatisfying conclusion for most people to draw however, as it requires them to put their trust in the hands of authority figures and effectively excludes them from the democratic process, which requires average citizens to form opinions on the problems that their society faces. In practice, many people unfortunately have a strong motive to disbelieve in climate change. The fact that difficult international negotiations over CO2 emissions are even necessary in the first place demonstrates that CO2 emission reductions will involve harm to our economy. After all, if there was no economic harm involved, every nation would agree to phase out carbon emissions completely. In this sense, some climate change activists will tend to appear dishonest to the general public. Furthermore, those of us responsible for the majority of emissions live in countries with temperate climates, that are expected to be relatively unaffected in comparison to the third world. The catastrophic predictions made for our future will happen long after most of our electorate is dead, while the economic impact of emissions reduction happens immediately. Thus, even when we do have a haunting suspicion that the catastrophe predicted by activists and scientists might really happen, it become attractive to point our fingers to India and China and proclaim that they will not reduce their emissions either and thus the sacrifice asked of us should be rejected. Finally, climate change has become a very partisan issue. Environmentalism used to be something that had proponents on both sides of the political isle. Earth First! was largely composed of self-proclaimed rednecks and Republicans, who were upset to see the American countryside ruined. As global CO2 emissions continued to increase rapidly, the need for rapid rather than gradual emission cuts began to increase too. Thus the emphasis was drawn away from solutions like population control and immigration reduction which have a gradual effect and were once commonly suggested as part of the package we would need to solve the crisis. Such solutions were championed by the founder of Earth Day among others and might very well have found some appeal among the right wing of the spectrum too. Eventually Al Gore came to be seen as the face of climate change activism due to his successful documentary, which meant that any conservative who wished to take the problem seriously would have to join forces with a figure he spent years of his life railing against. Thus climate change became a partisan subject, irreconcilable with conservative and free market ideologies. As industry began to move offshore from Europe and America to Asian countries, another problem showed up, the growing impression that addressing the issue would involve move wealth away from our nations to the third world. After all, it is correct that nations with a renewable energy grid like Germany and Denmark have some of the highest electricity prices in the world. Thus, addressing climate change is now increasingly perceived as some sort of sacrifice the first world has to make for the third world, something quite unpopular in developed nations that are already faced with economies in recession and large refugee streams. Unfortunately, it is now too late to change the public perception of climate change. It’s also probably too late to successfully address climate change, unless some sort of cost-effective technology for negative carbon emissions does happen to emerge. What might a solution have looked like? Back when the problem first became apparent, climate change activists and scientists should have focused their effort on the group that could have been expected to become most difficult to persuade, the political right wing. From the start, the emphasis should have laid on restricting excessive economic growth, which has proved to be very tightly correlated with growth in carbon emissions. Appeals should have been made to put more emphasis on non-material values, such as family and shared religious and cultural heritage. It should also have been made clear that exporting our first world standard of living to the third world is irreconcilable with a stable climate. In addition, economic self-reliance should have been encouraged at every level, from the individual, to the community, to the nation-state. On a national level, this could have been achieved with high import tariffs. Such policies could have avoided the transition to a service based economy, which proved to be the trigger for the growth spurt of the Chinese economy. It could also have helped prevent deforestation in Brazil, as until the export to China began to grow, most export of soybeans was to the United States and other developed nations. A more self-reliant economy would have been one where meat consumption would remain relatively low and people would instead feed themselves with crops that can be grown domestically. Unfortunately, as a society we placed emphasis on economic growth and education, both of which serve to move people away from the countryside towards jobs in the city within the service economy. Most people with a college degree are unwilling to spend their days engaged in subsistence agriculture. As they were drawn away from their natural community, people began to place emphasis on conspicuous consumption to prove themselves successful to their neighbors. In tight knit communities, people are more interested in what you do for others, rather than how many polluting toys you have managed to acquire through your cubicle-labor. It should not come as a shock that a hyper-individualistic nation like the United States has a level of carbon emissions per capita much higher than that found in Europe and other developed nations. As evidence for the assertions made above, consider the conspicuous consumption engaged in by conservative states, compared to that engaged in by progressive states. 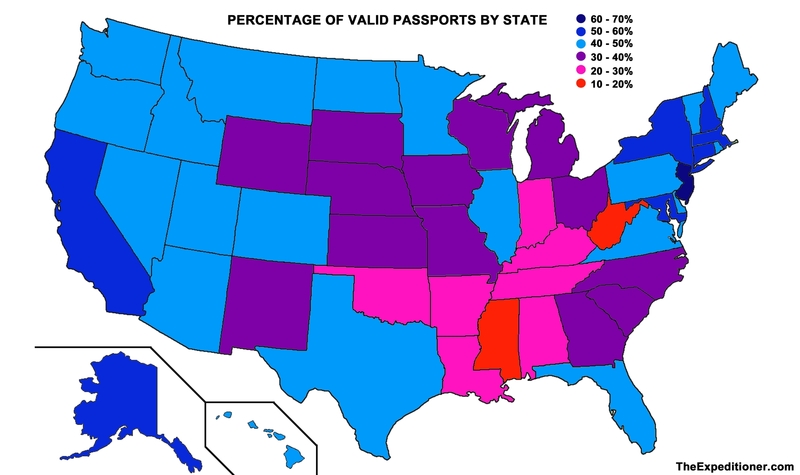 In New York and New England, more than half of the public has a valid passport, compared to less than twenty percent in Mississippi and other surrounding red states. Globalization is a progressive value and inevitably brings with it the bloated high carbon lifestyle that characterizes the developed world today. For young people today, travelling abroad has become an important hallmark of your social status, as Facebook profiles are decorated with identical pictures of foreign destinations. Unfortunately, addressing climate change required giving up on one value that most progressives were unwilling to abandon: The one world dream.